Senior Night for the Yotes’ featured the honoring of three key senior players: point guard Everett Turner, forwards Ramon Eaton and Shawn Joseph. As well as a close two-point loss to Cal State Dominguez Hills, 75-73. Turner, Eaton and forward Dorian Butler were the highlights of the game with double-digit scoring performances. This game also highlighted a consistent problem throughout the team’s season: lack of chemistry with little veteran support. “It was just a group of guys that didn’t know how to play with each other and weren’t used to this tradition and program,” said center Latrelle Standifer. A six-game losing streak capped the men’s season—they ended with an overall losing record of 11-14. Most games were played away this season which was a huge contributing factor to the conference. The team had to practice in the Den, the smaller gym below the arena, due to the volleyball team using the Coussoulis Arena, ultimately altering the men’s training and playing as well. The roster featured a lot of new players who transferred from different programs, which involved learning and playing new concepts routines and plays. “Many guys on the team didn’t know what we were actually playing for […] we have to do the little things like showing up on time for practice and understanding new plays,” added Standifer. Most of the scoring was completed by experienced players program, including Turner, who accumulated superb stats in his last season. The two-time CCAA honorable mention recipient was named team captain this year. Turner finished the season in the top ten of 3-pointers made. He was also 9th in field goal attempts and was only one assist away from being top ten in that category as well. Turner was second in points scored this season and scoring average after forward Khleem Perkins, who averaged 12.2 points a game, while also having scored 304 points for the season. “Losing Turner and the other seniors will be different for us, but we still have experienced players and young guys looking to prove a point next season,” said Standifer. Overall, the team averaged about 69 points a game for the season but could have easily had more if not for the turnovers that plagued them throughout the year. The assist/turnover ratio was 1.1 and the team averaged around 13 in both categories. There were improvements in rebounding and on defense as well. “Midway through the season we changed up our defensive philosophy and that helped our chances of improving,” mentioned Standifer. 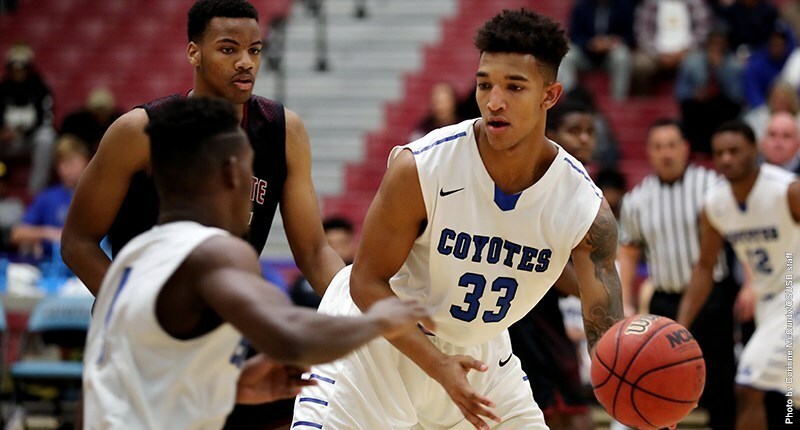 The ‘Yotes grabbed nearly 65 more rebounds than last season with an average of 30.4 for the year. They also averaged roughly three blocks and seven steals. Center Phil Reed was a major asset in those categories, leading the team in defensive rebounds and totaling 14 blocks for the season. Though the team had a sub-par season they plan to work harder by making changes in the offseason to return to their winning basketball tradition.